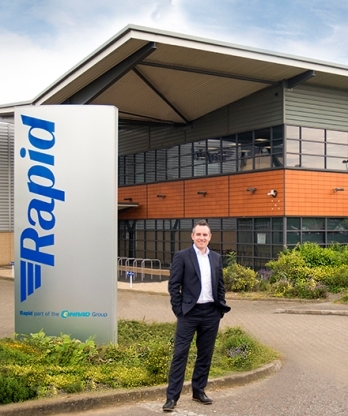 Rapid is one of the UK's leading distributors of electronic components, cables and connectors, electrical products, tools and educational resources. Rapid is committed to offering customers an unrivalled choice of products, competitively priced and suitable for modern application requirements. Our core stock of electronic components includes a huge selection of LEDs and optoelectronics, passive components, ICs and semiconductors, as well as an extensive range of automotive components and tools, electrical and power products, test, soldering and production equipment. We sell to the general public as well as the trade, and stock a range of leading brands of audio-video equipment, PC peripherals, hand tools and power tools. We have developed an extensive range of single board computers and prototyping platforms such as Arduino and Raspberry Pi, with applications across electronics and education. Rapid is also a specialist distributor of educational products. We supply primary schools, secondary schools, universities and colleges with curriculum-based equipment, instruments and learning aids. Subject areas include design and technology, science, robotics, maths, art and crafts, physics, computer science and literacy. We are committed to supporting educational initiatives and competitions which promote skills in science and engineering. All orders for in stock products received before 7pm Monday to Friday are despatched the same day. Rapid's significant number of distribution and franchise agreements with key suppliers also enables the company to order products on short lead times. So even if we do not hold current stock of a particular component, we will aim to source it for you quicker than other distributors. We offer new products from world-leading electronics, tools and education brands, such as Kingbright, Arcol, Velleman, Blore Bowron, GW Instek, Neutrik, Bourns, Kemet, Recom, Bulgin, Cherry, Finder, MK, Draper, Sealey Tools, Bosch, Duracell, Fluke, ABB, CamdenBoss, Hammond, Weller, Stontronics and FLIR. View our complete list of brands here. Rapid Electronics started life in a converted room above a garage in Kent in 1979, servicing the public with a small range of electronic components (approximately 200 lines). Advertising in the retail electronics press generated sales and a small single sheet ‘Catalogue' was mailed to customers. After two years Rapid started receiving regular orders from the Education sector who expected to be invoiced and would pay within 30 days of date of invoice. Rapid was able to finance this credit facility to customers due to the relatively small number of customers requiring credit and the improved relationship with suppliers. In 1983 Rapid moved to a small building on an industrial estate in Boxted, near Colchester in Essex. Increasing sales, particularly into the educational sector, brought computerisation of the business and a move to a larger building adjacent to the existing unit in 1985. Once again an increase in stock holding and product range dictated the addition of a 3000 sq. feet floor within two years. In April 1989 Rapid moved the short distance from Boxted to a site on Severalls Industrial Estate, Colchester, totalling 18,000 sq. feet. The 1990s were a period of huge growth in turnover, staff and product range. In July 2000 Rapid moved to a new custom-designed distribution centre on Severalls Lane, Colchester, which has 35,000 sq. feet of warehousing and 10,000 sq. feet of offices. This site has excellent development potential, and will support a total warehouse area of over 100,000 sq. feet. 1999 saw the introduction of Rapid's first full-colour catalogue. A website was launched in 2002, which two years later gave customers the opportunity to browse and buy products online. In 2006 the website was relaunched as www.rapidonline.com. In 2007 a new Trade Counter was opened with the capacity to stock 4,000 products, and in the same year Rapid won Supplier of the Year for companies with over £3million annual turnover at the Education Resources Awards. In 2011, two years after the company celebrated 30 years of trading, www.rapidonline.com was relaunched. In 2012 Rapid became part of the Conrad Group, a multi-channel pan-European electronics retailer. In 2015 the company was shortlisted for the prestigious category of Distributor of the Year at the Elektra European Electronics Industry Awards.